Snapshot measuring 3 x 2.5 inches. Happy Veterans Day! As we honor the hard work of our service men and women by taking a holiday, I like to imagine them catching a break, too. Hence this photo for today’s post. 11 Nov 2011 at 6:09 pm M.O. Very nice! I like the foreground image of the reclining man. Just what he is reclining on (it looks mighty precarious) is a mystery! Thanks! 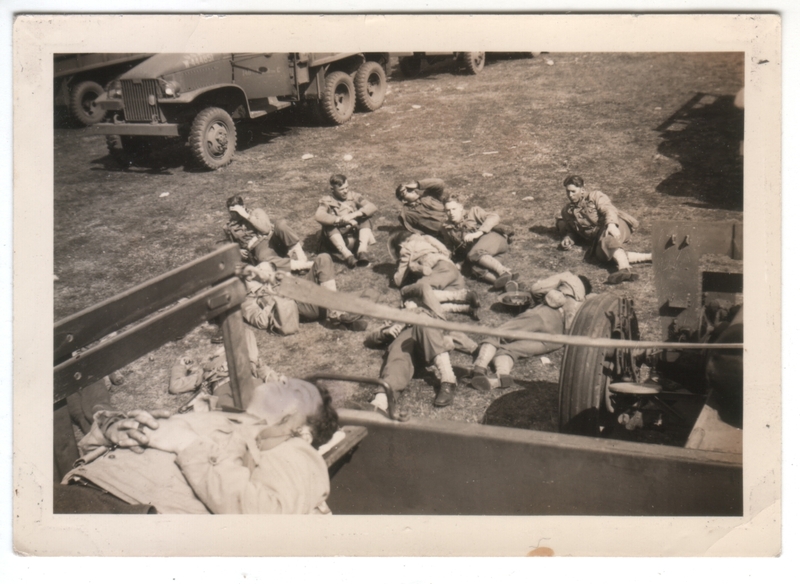 I’ve been operating under the assumption that the photo was taken from the back of some sort of troop transport truck, that the strap across the center of the photo was to keep people from falling out, and that the guy in the foreground was lying on a bench. But I’m happy to hear if somebody has a better idea.